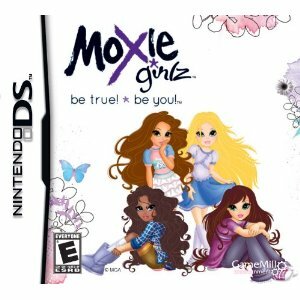 Flip Out Mama: Hot Gift: Moxie Girlz for Nintendo DS! If your house is anything like mine, video games always top the Christmas Wish List! Tater is asking for an iPod Touch, and a Nintendo 3DS.. I mean come on, he is FIVE! But, what good is the system without awesome games to go with it? Now, I will admit, we don't get many requests for anything Moxie Girlz around this house, but I thought this game would be great for my niece! She is totally into fashion and cool "girlie" stuff like that, so I knew this would be perfect for her! Every girl has the strength to do something amazing. Anything is possible as long as you stay true to yourself and never give up on your dreams! What is Moxie? 1. Positive attitude and confidence. 2. The courage to go for it. 3. Energy in everything you do. Moxie Girlz are full of energy and self-confidence. She’s unique, bright, empowered, brave, and stylish. Moxie Girlz can do anything! Now, how can you not love that!? I knew as soon as we received this game, that it would be one of my niece's favorites! In this game you can dress the girls up to be in their own fashion magazine! You can choose their outfits, accessories, etc. Then you do a fashion shoot with the girls and they star in their own fashion magazine! There are plenty of opportunities to earn new outfits, backdrops for photo shoots, etc, to keep the game interesting and fun! I love that this game can help girls express themselves and be whoever it is that they want to be! My sister says that my niece has barely put this game down, and that she is always showing off her "fashions" to everyone in the house! If you would like to bring this game home for the fashionista on your list, it's only $19.99, and its rated "E" for everyone! You can check it out here! We received a sample product of this game in order to conduct our review. All opinions are my own and I received no monetary compensation!